Between August and the first week of November alone there were six major bomb blasts in which six people were killed and more than a dozen injured. I am not including the many other instances of bombs or grenades being lobbed in residential areas. Significantly there have been no claims so far by any of the underground outfits operating in the area regarding their involvement in the bombings. Nor has there been any breakthrough by the police in these cases. In the midst of this immense silence after the explosions, the cries of the victims are being lost. Recently we have been visiting some of the victims to see how they are coping. In many of the cases we were surprised that the money announced by the state government to help in their treatment had either come only partially or not at all, mainly due to the long bureaucratic process involved. Recently we also staged a dharna [sit-in] protesting the recent trend of bomb attacks under the aegis of the Conflict Widows’ Forum, one of the forums established and being mentored by our organisation. 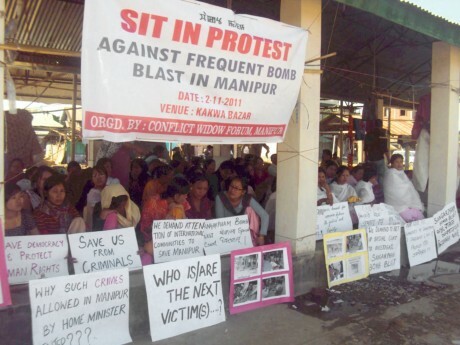 The main participants of the dharna were victims of bombing incidents, family members of those who were killed in bomb blasts and young women whose husbands have been killed in the ongoing conflict in Manipur. Dharna, as a mode of protest and to register our voice on certain issues, is a much used method of our organisation. It not only helps us state our concern and our demand to the government and all other stakeholders, but it also helps in forging solidarity and links among the participants of the dharna itself as many of our participants come from different backgrounds and circumstances. Yes, sometimes we begin to wonder whether these dharnas are effective or whether anyone is hearing our voice, considering the fact that we have conducted so many sit-ins and so many press meets and yet the violence continues. But here I must say that the dharna is one of the most democratic and non-violent means of protest, and therefore perhaps a good, if not the best way, to make ourselves heard. That is why in Manipur, for every incident – be it bombings, killings, kidnappings, shortage of essential commodities or demanding a better pay scale – every section of the society uses it, and we see the photos of dharnas in newspapers almost every day.